Oscar Wilde once wrote, "True friends stab you in the front." 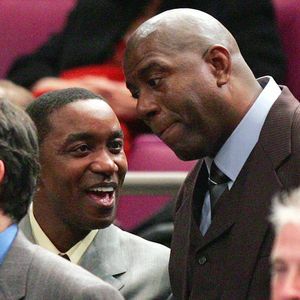 Needless to say, basketball legends Isiah Thomas and Magic Johnson ceased being true friends a long time ago. In the 1988 NBA Finals between the Pistons and the Lakers, Thomas and Johnson kissed and fought; and after they played each other again in the '89 Finals, their good times together were all but gone. Their friendship never recovered from those wars. But now, with the release of Johnson's new book, "When the Game Was Ours," we have a firmer understanding of why the rift existed in the first place, and why it has lasted as long as it has. Andrew D. Bernstein/NBAE/Getty Images No more kissin' up to each other after the revelations of the past couple of weeks. In the book, which Johnson co-authored with Larry Bird and frequent ESPN contributor Jackie MacMullan, Johnson admits he helped keep Thomas off the 1992 U.S. Olympic Dream Team because he believed that, in the wake of Johnson's announcement in 1991 that he had HIV, his once-dear friend spread a rumor he was gay or bisexual. For most of the public, this is a startling admission, but Johnson's sexuality has been gossiped about in NBA circles for years. That can be chalked up to ignorance about his disease. Thomas, now the men's basketball coach at Florida International University, denies speculating about Johnson's sexuality and told SI.com he feels "blindsided" by the allegations because this is the first time Johnson is publicly airing his side of the story. I can't tell you whom to believe because this is a clear-cut case of he-said, he-said, but Thomas deserves more benefit of the doubt than people are giving him. The fact that John Stockton chose Thomas as his presenter for his enshrinement into the Basketball Hall of Fame shows Thomas isn't evil incarnate, as some apparently like to think. "He's done some things behind the scenes that people don't know about," Stockton told The Salt Lake Tribune. "I'm certainly not going to talk about them now ... but he's shown a lot of class." I realize Thomas doesn't have much credibility in light of the sexual harassment suit filed against him and Madison Square Garden during his time as a Knicks executive (the civil suit ultimately was settled) and a bizarre incident last year in which someone who might or might not have been Thomas was rushed to a hospital for what might or might not have been an overdose of sleeping pills. Ask people around the NBA what they think of Thomas, and you hear both sides: He's either a great guy or a devious manipulator. Of course, Johnson has every right to tell his story in his own way, but to put Thomas on blast after all these years strikes me as strange. "It was time," Johnson said in a teleconference Monday to promote the book, which is primarily about how his relationship with Bird transformed basketball. "We had an incredible relationship. We used to do everything together back in the day, and then that kind of faded. It was a tough period. Probably when we played those two championships made that happen. Then it just really went in opposite directions from then." What's sad is that the differences between two of the greatest basketball players ever have lasted 20-plus years, in part, because both men were too proud to squash them. Fierce competitiveness made them phenomenal players, but it also ruined their personal relationship. Understand that I respect and like Johnson immensely, and I have personal ties to both players. I went to Michigan State, where Johnson led the Spartans to the NCAA title in 1979 -- still the most memorable championship game in collegiate history. Johnson has been a cheerful giver to our alma mater; he has helped MSU build a strong, national reputation. I've gotten to know Johnson better since he has become an ESPN analyst, and he's one of the most genuine and engaging athletes in the history of sports. But I'm also from Detroit, and Thomas helped bring two NBA championships to us there. Detroit isn't a place people fall in love with easily, but Thomas has remained loyal to the city even though his hometown is Chicago. These two men, through their accomplishments and charitable contributions, have done more for Michigan and Detroit than some of the state's elected officials have. That's why they were two of my favorite athletes growing up. AP Photo/Julie Jacobson In the 2005-06 season, when Thomas was running the Knicks, they were still making nice. We might never know whether Johnson's accusations -- that Thomas spread the rumors -- are true. But Thomas vigilantly defended Johnson's right to play in the 1992 All-Star Game even though several NBA players, including Karl Malone, were opposed to it, citing their own health concerns. And Thomas' brother died of AIDS five years ago. Both factors should count for something. The secret, and understandably painful, disdain Johnson harbored for Thomas ultimately played a hand in costing Thomas what should have been one of the most prized moments of his career. Playing on the 1992 Dream Team would have further legitimized Thomas, whose place among the greats of his era sometimes seems less secure because his post-playing career has been so unsuccessful. I'm sure it wasn't difficult for other Dream Team members to side with Johnson because nearly every person on that team had a grudge against Thomas. Michael Jordan, who at the time was thought to be the ringleader of the anti-Thomas movement, certainly wasn't going to forget Thomas' conspiring with other players to freeze him out of the 1985 All-Star Game. In the heat of the Celtics-Pistons rivalry, Thomas publicly agreed with teammate Dennis Rodman, who said that if Bird were black, he'd be considered an average NBA player. And Malone showed his distaste for Thomas in December 1991, when he elbowed Thomas in the face, causing a cut that needed 40 stitches to close. A month earlier, Thomas had ruthlessly dropped 44 points on Stockton, who was given a spot on the Dream Team that many people thought should have been Thomas'. Thomas was no saint, but he deserved to be on that team. Until Johnson's book, the reasons he wasn't had been buried skeletons. Certainly, these back stories make for great reading in the present day, but wouldn't it have been a lot better if, once in the past 20 or so years, Thomas and Johnson had sat in a room together and talked this out? Maybe nothing would have come of it, but I'd like to think it might have gone a long way toward eliminating the sense of betrayal both these great players feel right now. On Monday, when Johnson was asked whether he had spoken with Thomas since his accusations became public, he as much as dismissed the possibility of a reconciliation. "If that day doesn't come, then it doesn't come," said Johnson, who also wished Thomas success at FIU. "Right now, we've both got a lot to do." As Arthur Miller said, "Betrayal is the only truth that sticks."